﻿Yes, I realize it's February. And yes, I am pretending it's July. Chris and I had a craving for something sweet the other day, so we went to the store in search of something to fulfill this craving. We didn't expect it, but mini watermelons were piled up in the produce section, just calling our names. They were so cute, we had to buy one! We also found pineapples, which we immediately picked up as well. Who knew grocery stores still carried watermelon and pineapple in February?! We whipped up a quick watermelon mojito and let me tell you, they really hit the spot. You can make them non-alcoholic or add a little rum, but either way they really do take you back to those cool, breezy summer days. We plan on trying the pineapple in a similar drink as well. Hopefully it will turn out just as great! Today is also Chris' birthday, so cheers to him!! Mash the mint leaves using a muddler. If you do not have one (which I don't!) place the mint leaves in a dish and smash with the back of a large spoon to release the juices. Remove and discard the rind of the watermelon and all visible seeds. Place the watermelon slices in a food processor and puree until smooth. In a large pitcher, add the mint leaves, pureed watermelon, rum, simple syrup and the lime juice. Stir to combine. 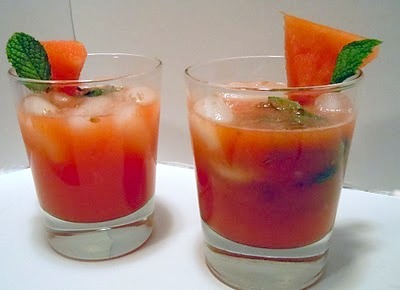 Serve in glasses with ice and garnish with a watermelon slice and a mint leaf. Bring the water to a boil in a small saucepan. Once boiling, add the sugar. Stir constantly until dissolved. Remove from heat and allow to cool completely. Those look awesome!! Its funny, yesterday I was telling my Mom how much I was craving a huge mojito - and was definitely contemplating going to the store to get ingredients to make some. Glad to know I'm not the only one craving these summer-ish drinks in the dead of winter!